In the United States, lunch is often a hurried trip to the vending machine, or the company cafeteria, or from a sack lunch you bring from home. Others make lunch a business appointment with a valued or prospective client. 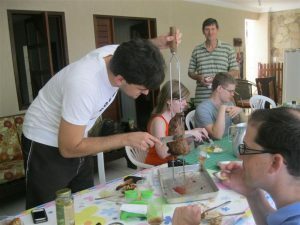 In Natal, Brazil, the culture for lunch is much different. Two-hour lunches are a way of life there. Many stores close between noon and two. Ironically, at lunchtime one day when I wanted to buy bread at a neighborhood bakery, the store was closed. Even those businesses that depend on customers to buy their food close at what would be the busiest times at Panera or Subway. I interviewed a successful dentist, Dr. Carlan, about the appointment schedule of the professional. A dentist for 33 years, he told me that he closes his office from noon to 2:00 and then works until 8:00 p.m. each day. When he was younger he would see patients even later than 8:00. Lunch is the large meal of the day for Brazilians, and the meal at night is food that is light; soup is very common for the evening meal. Our busiest times for reading appointments were what is the dinner hour for us in the United States: 6:00 to 8:00 p.m. Conducting business for Americans in Natal would require adjustments in our eating habits. I have always had trouble keeping mentally alert after lunch. You can imagine what challenges I have with the two-hour main mealtime of the day.